We coined the term Workplace-as-a-Service ™ in 2004 and have lived by it ever since! To provide ubiquitous access to non-dedicated office space and conference room solutions for mobile workers under a hosted model we refer to as “Workplace-as-a-Service ™”. Incubate startups, entrepreneurs, and small businesses by providing robust infrastructure services supported in the Cloud while cutting cost. CloudVO is well positioned to assist and amplify trends toward a more distributed workforce, increased flexibility, outsourcing of non-core office space, telecommuting, sustainability, and a growing demand from professional firms, start-ups, and enterprise workers for on-demand workplaces. We are a proud member of the Global Workspace Association. www.CloudVirtualOffice.com, aimed at freelancers, home-based entrepreneurs, professionals, and companies needing to establish a local presence in specific locations. www.CloudTouchdown.com, aimed at enterprise users and highly mobile workers who need touchdown office and Meeting Room access in multiple, sometimes undefined, locations. Our CloudVO Portal is designed for our local space provider partners to update their center information and CloudVO offerings. Laurent has set the agenda in Alternative Workplace deployment for more than 15 years. Prior to founding CloudVO in 2009, Laurent was the CEO of two successful companies in the Hospitality and Workspace Provider industries. He also held various executive and management positions at Sun Microsystems, Litchfield Advisors, and Hewlett-Packard Company, with responsibilities in Corporate Real Estate, Corporate Development, Operations, Finance, Customer Service, and Marketing. He holds an MBA from the Haas School at UC Berkeley. In May 2017, Laurent was rated one of the Top CEO’s in the country and 3rd in the San Francisco Bay Area by Owler. In determining the winners, Owler looked at over 160,000 CEO’s and identified the top 1,000 highest ranked leaders amongst 50 cities and 25 industries across the globe. 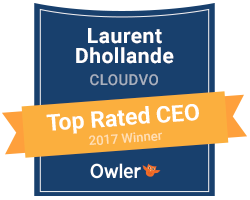 As a recipient of the award, Laurent ranks in the top 0.60% of all the executives on the Owler platform. Tracy has 20 years of experience in the on-demand office space industry, having directly managed and co-owned a handful of locations in the Sacramento area and Nevada. She co-founded CloudVO in 2009. She is a well-respected leader in the shared office space industry, having chaired the FraudWatch Committee and served on the Education Committee of the Global Workspace Association (GWA). Tracy is a licensed Real Estate Broker in California and holds a B.A. in History from U.C. Santa Barbara. Phelton has over 20 years of experience in Information Technology in various disciplines including data networking, application systems, traditional voice and VOIP systems, information security, and physical security. Prior to joining CloudVO, Phelton was the Director of Communications and Networking at the University of San Francisco and the Application Manager at BoldFocus. He holds a BA in Computers and Information Science from UC Santa Cruz and completed graduate studies at the University of San Francisco. Keith has over 20 years of experience providing Virtual Office services. He is a frequent industry speaker, known by Global Workspace providers as a virtual office pioneer. Prior to co-founding CloudVO, Keith ran some of the most successful virtual office venues in the industry including three locations in Silicon Valley and remains a Managing Partner of Pacific Workplaces. His main focus is to evangelize the benefits of Virtual Offices and Touchdown Space to mobile workers and entrepreneurs on behalf of our entire network. He holds a B.S. in Finance from Santa Clara University. Scott has more than 15 years of experience with virtual offices as President of an independent office business center company prior to co-founding CloudVO. Scott is an industry expert on technology infrastructure and a frequent speaker on data network and telephony issues. He served as Board Member for OBCAI, the international trade association of on-demand workspace providers which has since renamed itself as the Global Workspace Association. Scott has a B.S. in Business Administration from The University of the Pacific. Karina joined CloudVO in the fall of 2015, bringing over 8 years of experience in marketing and public relations to the team. Prior to joining the CloudVO team, Karina managed sales and marketing for a successful business center in Northern California. Karina’s passion for travel and fashion led her to Florence, Italy, where she earned her M.A. in Marketing and Management from Polimoda, Institute of Design and Marketing. Brandon Joined the CloudAnswering team in the spring of 2016 after graduating from Sacramento State University with a B.A. in Political Science. Brandon became the CloudVO Telecom Systems Manager in the fall of 2017. He is now in charge of ensuring that excellent phone services are provided to our clients. Always being tech savvy, he has found a passion in the telecom system we offer here at CloudVO. Brandon is also staying busy as a full-time Graduate student perusing his Masters in Educational Leadership and Policy Studies. Angela joined the CloudAnswering team in November of 2016 as a receptionist. Her love for learning about, working with, and meeting new people has influenced her educational and career choices. She earned a B.A. in Anthropology from Sacramento State in 2011. Her career as a Community Manager with a group travel agency allowed her to travel to amazing places in the world and gave her the experience of working with several hundred clients. In the fall of 2017, Angela took the positions of Operations Manager at CloudAnswering, managing the team and client outreach.